The Chamber & Developmant Council of Crawford County represents all Communities in Crawford County Iowa. 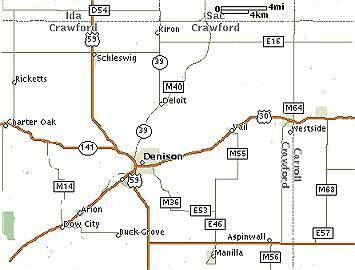 Denison the county seat is centrally located, with easy access for all the surrounding communities with only a 20 minute drive to the County Court House. Please take a moment to find out about the communities in Crawford County. Use the links listed below or click on the map to find out more.